Some times life just seems like an upward battle. I say “Upward” because I always keep thinking of the prize of heaven, but the battle part is what gets me feeling down. This week has been one of those weeks. I have been struggling with dizziness and just a sense of yuck…..my academic mind wants to find a reason why I feel this way: but as others know who have disabilities…we do not always know why our body checks out on us. I kept trying to keep a positive attitude through these feelings of overwhelming discouragement. I often count my blessings. This helps, but this time it just didn’t keep the “woe is me attitude” at bay. I started to think of things I look forward to like the change of seasons. During my reflection of what I wanted to do this summer…my husband pointed out a cool thing that came out of all the cold and ice we have been experiencing. He told me about this incredible phenomenon that is happening in Maine on the Presumpscot river. 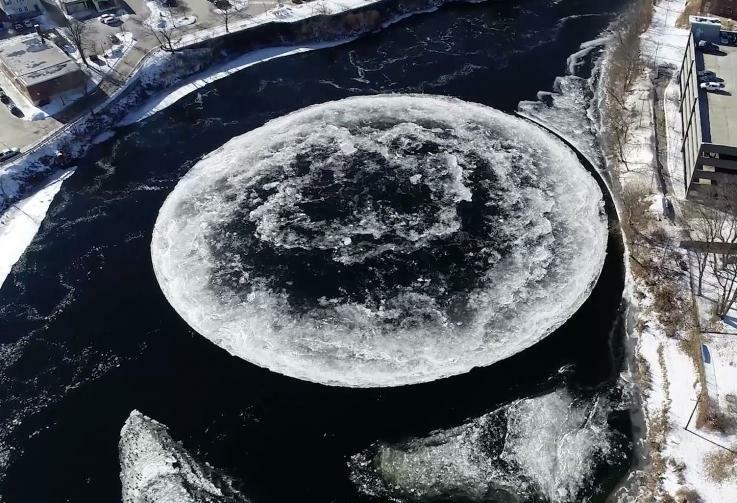 A 300 foot Ice disc formed by just spinning for 3 days on the river. The ice disc stopped spinning in Westbrook, Maine, and hundreds of people are enjoying this natural beauty. Hearing this story took that “feeling sorry haze” off of me. God met me where I was at and provided an excellent example of how in all things, even nature, His design is perfect. Like many other people who needed a positive boost….this disc provided it. It is my prayer that when you feel down and stuck in a rut…that you remember this verse. God has a perfect plan for each of us and He will provide for all our needs and provide the sweetest refuge. Take a moment and just look at how God takes care of all the animals…and how so much more he will care for us. Next PostNext Darkness cannot “Drive out Darkness: Only Light Can do That….Hate cannot Drive out Hate: Only Love can do That”! – Martin Luther King Jr.